December saw the weather get colder still, with temperatures dropping as low as -11 in the middle part of the month, and snow remaining on the higher peaks throughout the month. 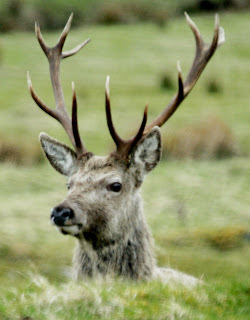 October in the Cairngorms National Park sees the true arrival of Autumn. The days shorten, temperatures drop , the trees take on their glorious golds, coppers, russets and reds and the influx of Winter visitors gathers pace. The arrival of Whooper Swans on our local lochs, their large size, mainly yellow bills , straighter necks and bugling calls making them easy to identify. Our first sightings of incoming winter thrushes, the Redwings are first to arrive, their thin 'seep -seep' calls betraying their presence whilst flying, accompanied by 'continental' Mistle Thrushes & Blackbirds, the Fieldfares usually being the last to arrive. The Male Red Grouse on the moors appear to be much more aggressive & vocal, perhaps already trying to establish territories in preparation for breeding season? The 18th October gave me a great close-up view of a Barn Owl hunting over a local marsh. Using the car as a hide, I parked up and it actually landed on a roadside fence-post less than 20 feet away - a marvellous sight! The Mountain Hares are beginning to get their White Winter coats, from their feet upwards. The heather-clad hills looking at their beautiful deep purple best. Mountain Ash or Rowan trees full of Autumn berries (see pic). The Roe Deer rutting, their loud barking calls alerting us to their presence. Large flocks of incoming Greylag Geese seen arriving from further North. Mixed woodland flocks increasing in size and numbers of species - picking out the Cresties is quite a challenge - unless their chuckling trill gives them away! Large flocks of Mistle Thrushes were noted - presumably Winter visitors from further North. Dippers on the rivers were heard to sing again for the first time since Spring. Mid-June saw me take a trip to Sutherland on the North West coast of Scotland to visit the Scottish Wildlife Trust's beautiful Handa Island Wildlife Reserve. Just a 10 minute ferry crossing from Tarbet, during which we saw Black Guillemots and Seals, sees you land on one of the small, uninhabited island's many unspoilt sandy beaches. A short walk through heather moorland provided Meadow Pipits, Stonechats, Wheatears, Sedge Warbler, Skylarks, and a super close-up of a family of Red Grouse, and aroused plenty of interest from the nesting Arctic Skuas & Great Skuas, though thankfully, they were not particularly aggressive on this occasion! The main attraction of Handa though is the island's 300ft+ high sandstone cliffs and the huge (200,000!) 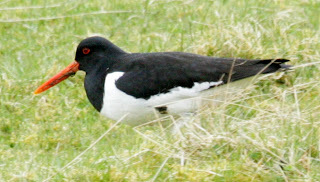 numbers of seabirds that nest on them. From our clifftop viewpoint we saw, heard (and smelt!) Guillemots, Razorbills, Kittiwakes, Fulmars, and most popular of all, good numbers of Puffins (see pic),often at close range - a breathtaking spectacle that I highly recommend. 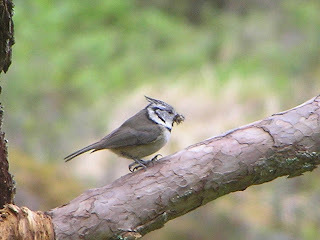 Early June saw many species with newly-fledged young, causing many aaaaahhh! exclamations amongst my customers as doting parent birds were seen dutifully feeding their wing-quivering offspring. Though the weather has still been a little changeable, the days have now lengthened to around 20 hours of available birding time, for those with the stamina to attempt it! The combination of sun and rain has given a very lush look to vegetation and inspired the wild flowers to bloom, and accordingly, more butterflies are now being seen regularly. Seeing one of our local Ospreys delivering a good-sized trout to the nest. 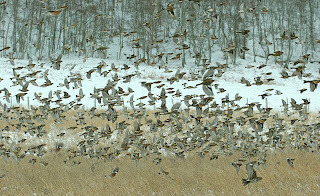 A Peregrine Falcon hunting waders over a riverside field. 7 Buzzards circling together using the same thermal in a beautiful local glen. Regular sightings of Cuckoos, often being chased away by Meadow Pipits. Late April saw fantastic weather - high pressure and clear skies meant cold, crisp mornings followed by warm, sunny days - perfect safari conditions. Safari highlights (as voted for by my customers) were several good dawn sightings of Otter on the River Spey ( a good way of justifying the 4am alarm clock!) , lekking Black Grouse, calling Cuckoos, Ospreys catching fish and delivering them to the nest, a hunting Red Kite, good views of Scottish Crossbills, and an amazing close encounter with 2 Ptarmigan. With bird day-lists now hitting 60+ and mammal day-lists of 7-8, it is probably fair to say that we are getting into peak safari-season! 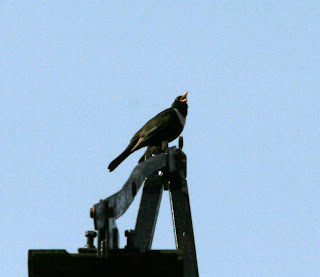 Mid April at last saw us enjoy some Southerly winds and warmer weather, and with it came some of our returning migrant birds, with species such as Ring Ouzel (see pic), Wheatear, Common Sandpiper, Willow Warbler, Chiffchaff, Swallow, House Martin & Sand Martin all being seen in this area for the first time since late Summer last year. Capercaillie always seem to feature on my Safari guests "wish-lists", but are one of the most difficult species to see, with many hours searching in suitable forest usually ending in failure, or at best, with a fleeting glimpse of the backside of one as it disappears noisily into the canopy, it having seen you long before you saw it! However, help is at hand in the form of the RSPB early morning Caper-Watch , which takes place at their Loch Garten reserve between April 1 and May 20, with the Osprey hide and a specifically built new hide overlooking a traditional lek site giving us a much better chance of seeing this magnificent creature. With as many as 4 Capercaillie being seen on some mornings it is well worth a visit, and also means less pressure on other sensitive lek sites. April started with the weather showing signs of improvement, with the Easter weekend being particularly pleasant, and ideal for safaris. However, with no Southerly winds to report, returning migrant birds were still very thin on the ground. Despite the lack of migrants, day-lists of birds started to creep up into the mid 50's, with day-lists of mammals regularly reaching 7 or 8. My personal favourite sighting of early April,s outings had to be the return to her nest of a female Osprey - to be joined a day later by a male who soon earned his conjugal rights by bringing her regular fish deliveries! Another highlight was a close-up fly -past by a dashing male Merlin with a small bird clutched in his claws, which interupted our viewing of the (still mainly white) Mountain Hares in a beautiful mountain glen. The Slavonian Grebe was seen to have transformed from it's uninspiring black and white Winter colours into it,s beautiful summer plumage with those amazing gold ear tufts seemingly glowing in the sunshine. Most of the other "local specialities" continued to show well and I think it' fair to say that my safari customers went away very happy with what they had seen , if a little tired maybe, after the 5am starts! 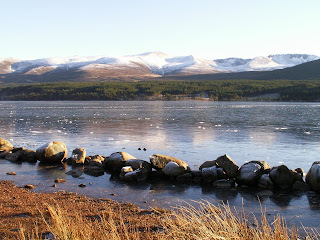 The third week of January saw decent falls of snow in the Cairngorms region, and with the wind dropping ,(at last!) good number of people were able to enjoy the first snow sports opportunity of this Winter. Wildlife highlights included good views of a large flock (300+) of Bramblings (see pic), on local farmland-their blackish heads, orangey breasts and white rumps showing well as they whirled around in a close-knit flock, with a few Chaffinches, Goldfinches and Greenfinches for company. The first half of January was not perfect weather-wise for wildlife watching, with high winds and rain dominating. However, Bird highlights included: A beautiful Barn Owl on nearby farmland, a hunting Red Kite low over the A9, and a decent view through the scope of a Golden Eagle, all on the 2nd. A rare day of dry,cold weather on the 6th produced a decent day-list including a good, close view of 7 Whooper Swans on a flooded field close to the River Spey, a Hen Harrier (ringtail) and 4 Black Grouse on the moors at Dawn, and a close encounter with a gorgeous Mountain Hare, it's pure white winter coat making it very easy to pick out on the virtually snow-free slopes of a local glen!